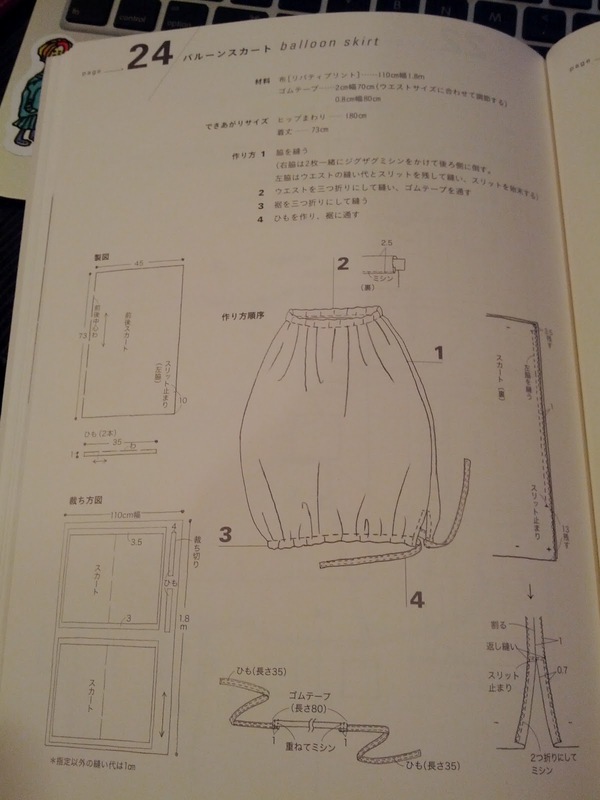 When Tilly from Tilly and the Buttons posted a review of this DIY Couture sewing book last week, I immediately looked at my recently acquired Japanese sewing book: かんたん,かわいい.まっすぐソーイング (Easy, cute. Sewing in a straight line). The idea behind this book is to show that you can create beautiful and wearable garments without patterns and using only straight stitches on your sewing machine. All 27 pieces from this book are one-size which is another advantage: the book is a great source of inspiration for presents. I am already thinking of making a dress for my mom's birthday ;) She lives many thousands of kilometres away and I only remember that she fits something between a European size 42 and 44. I'll let you know the results! Did you notice that it's made from Liberty? This books gives lots of confidence and inspiration not only to beginners but also to more advanced seamstresses. The instructions are very straightforward: you don't need to know Japanese to understand them. And that's why I like Japanese craft books SOOOOOO much! Do you feel inspired by the book? That book looks awesome. I just bought a book that really inspired me. It's called Drape Drape and the silhouette's of the garments are just amazing. The best part is that the book includes patterns for all the garments illustrated in the book. Amazing! They've launched the 3d volume of Drape Drape earlier this year and it's translated into English as well! Those books are really amazing to work with! Yes I do!! It´s so inspirational! I bought my last amount of fabric a few hours ago... so I´m researching in differents blogs. I need a book like yours, it´s so creative!